I finally had a few free minutes to play on the computer and download the last of the pics I took at CHA. I was able to get a nice picture of Tim Holtz doing a make 'n take on the Ranger booth using his new Distress inks. I did want to give it a go, but there was a queue (obviously) and the wait was way too long! On the other end of the Ranger booth, Suze Weinberg was demoing and having a play with her ultra thick embossing crystals so I stopped by to say hello. Suze and I have known each other for years since we both used to do stamp conventions in the States together. She always has time for a quick pic. She's a lovely and very talented lady. Hi everyone, I finally have some internet access on my laptop so I can finally show you some of my CHA pics. The hotel we were staying at for the CHA show only had wireless access in the lobby and I still couldn't get it to work! I'm staying this week with my best friend and my computer likes it here, lucky enough! Our first stop at CHA was the Spellbinders booth to see all the new products. Their newest fun play toy is the Presto Punch machine (shown below). This is a battery operated punch machine that will have an electrical adaptor available for it. The machine will be available in England after April with the English plug on it I am told by the owner of Spellbinders. The machine comes with an assortment of seven punches and there are many more that are available to be purchased separately too. We don't have a suggested retail on the machine yet, however. 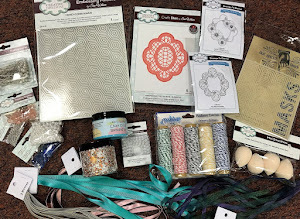 Spellbinders also has quite a few new Nestibility designs as well as a lovely selection of dies that work really nice for scrapbook pages and cards. Here are a couple of examples that I found at their booth that I thought were very cute. Hello everyone! It's the start of my fourth day here in California and it is the first moment of sun that I have seen so far! I'm not sure if it is going to last, but I will take what I can get! It has been torrential rain up until now! My daughter and I went to the CHA Craft Retail Supershow yesterday. We waited in the queue with hundreds (maybe even thousands) of other fellow craft enthusiasts. The doors didn't open until 12 noon and we arrived around 11:30am. It was quite exciting to say the least. The show was a lovely mix of rubber stamping and scrapbooking and fabric related crafts. I was pleasantly surprised to see that even with all the people waiting to get in, the show was so large, it never felt very crowded. No wiggling through the crowds to get through to see what you wanted! We had a lovely day and were able to easily get in to all the stands and have a nice look around. I did fall prey to some lovely border punches and nice stamping papers myself. I can't wait to use them in my next stamping session! Well the news wasn't good today when I was told that the Particraft computer was terminal, no possibility of resurection! The message wasn't kidding when it said hard drive failure was imminent! So, here's the thing, I am going to the wholesale Crafts show in California later this week so the computer won't be sorted for at least a week's time. Please do not send any emails to Particraft as I do not know if they will be retrievable before we get a new computer set up. If you do need to contact us, please phone the Particraft number which is 01536 514770. Karen Lines will be handling all the calls while I am away (which will be two weeks). Since I am heading over to the CHA (Craft and Hobby Association) show in Anaheim, California, I am going to try to take some pics and post them on my blog (Don't be jealous though, it is supposed to pour rain for a solid week, just my luck!). 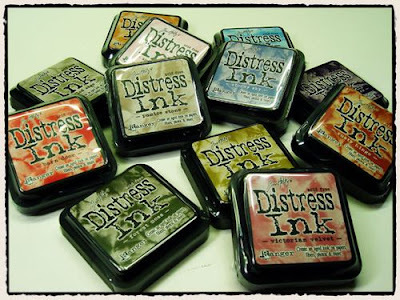 But, just to let you know a few of the things that I have been told about already, Ranger has just released 12 new Tim Holtz Distress Ink colours that they will be taking orders for at the show. We will have them for sale as soon as they can be shipped over. Tim Holtz has also added new items to his Idealogy Range that we will be stocking. Spellbinders, the company that brings us the wonderful Nestibility Dies are also expanding their line and we will be stocking those new dies as well. I plan to have a good look at everything that is being shown so who knows what new crafting ideas I might stumble across! I was hoping to put this blog up yesterday, but my computer had other ideas. It has been a bad week for me and computers as the Particraft computer at work on Friday gave me an ominous message that said "hard drive failure imminent" and that was as far as it went for me. No turning on, no checking emails, nothing. Not a good sign. So the tech guys have come and taken it away to be fixed. If you sent me an email and haven't gotten a reply, this is why. It is supposed to be sorted by early week so please be patient. Then Saturday, my laptop followed in it's footsteps and decided it wasn't going to play nice either! So I spent most of yesterday getting it sorted out, so I didn't get a chance to post the last of my jungle cards as promised. Computers! You either love them or hate them, depending on how they are behaving for you, huh? Thank you for all the lovely emails this morning. It was really nice to know that there were some of you watching at that early hour (from under the comfort of the duvet I hope!) It is always such a blur to me when I am doing one of those shows. All the things that I forget to say or do (Like forgetting to get the stamp for the demo ready, what a blonde moment that was!) At least I was only trying to demo a card, not do brain surgery thankfully! I did spend a fair amount of time this week looking for a few jungle cards that I had made a while back and could not for the life of me find them anywhere. I finally gave up the search and a few days later, I remembered that one of the stamping magazines had requested some samples for an article they were doing on the jungle stamps. So hopefully that issue should be out soon so if you have purchased the jungle stamps, you will have a few more ideas for them from the article. Alright, who did it? Who made Mother Nature so angry?! I am beginning to wonder if the snow will ever stop! I thought we were having global warming, not global cooling! The new blog candy contest is up and running again with an incredible pile of new crafting goodies to drool over! We have added a few new items for the winner to have a play with too. This contest will see the winner receiving 2 A4 sized stamp sets both with a guy theme this time, 4 A5 sized stamp sets including all of the autumn foliage sets as well as a great set by Sheena Douglass. There is a package of clear shrink plastic, a set of 6 Cosmic Shimmer ultra thick embossing powders, Tim Holtz Fragments, 200 ml clear embossing powder (always useful), Cosmic Shimmer Twinkles in Aqua, a Big 'N Juicy Stamp Pad in Spice, Tim Holtz adage tickets, Cosmic Shimmer Iridescent Sparkle pigment set, Adirondack pigment ink pad, Luminarte Shimmer mist spray, Fancy Pants buttons and crocheted flower sets, Cosmic Shimmer Glitter set, a tube of micro beads, and Cosmic Shimmer heat bondable fibres. Check out that loot! 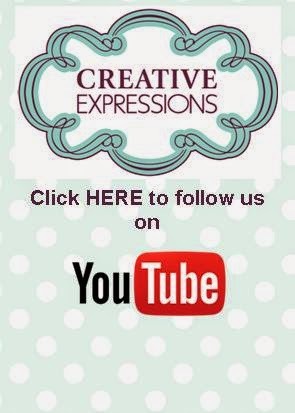 Again, please play along and let me know you have been keeping up with the blog by leaving a comment after each new post I make and you will receive an extra entry into the blog candy contest. I also want to show off a few more projects that were made by one of the followers. In fact, these pics were sent to me by Edna Taylor, but you might know her as ROSIETOES! Yes, Edna just nabbed the last candy from everyone. Be nice, she may have taken your prize but she has left us with some exceptional nice work to admire. The top pic shows the front of the tin and the bottom picture shows the back of the tin with an extra pocket to hold stamps. How clever! These altered tin pieces were made using the Particraft Jungle and Safari sets, the same ones that I am demoing on Sunday morning on Create and Craft (don't forget to tune in and send me an email!) If I have to be up that early, everyone else does too, okay! LOL. How cute are those pieces! I just love this set, it is so much fun to play with. If you haven't gotten it yet, maybe Edna's work will inspire you! There's got to be a little suspense built up for this loot, huh?! Anyways, the winner is ROSIETOES!!!! Congratulations! I need each of you to please email me at sales@particraft.co.uk with your postal addresses so that I can get your prizes in the post to you. Just a few more cards to try to tempt you. These cards have been made using the Particraft Hostess Gift Stamp set that is still available until the end of January as a free gift if you host a Particraft party in your home. This set called ''Winter Fun'' is not available for sale but, if you like what you have seen, you can just contact Particraft and we will arrange for one of our demonstrators to come to your house to demonstrate loads of the amazing products that we offer, including the lovely Cosmic Shimmer line. The hostess gift is then yours free of cost, plus plus plus you will also receive 10% of the total of your party in free merchandise of your choice! What a great way to beat the Jaunuary (after Christmas) credit crunch, huh? These two adorable cards were made by one of the blog followers, Beckie Robinson. 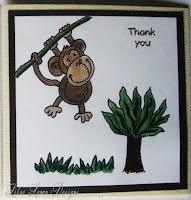 Beckie purchased the monkey business and the jungle safari stamp sets recently and has sent me through these lovely cards to showcase her talents! How cute is that hippo with the flower behind his ear! I just love to see what everyone does with the Particraft stamp designs. It is so much fun to be able to look at everyone else's ideas for a change! Becki's cards, however, have made me realise that I have to get back to work myself on some jungle cards as I have been asked back to Create and Craft to do another jungle themed show. The show is scheduled for January 17th at 9am. I know, I know, it's a Sunday morning and that is an awful hour to be up, coherent and crafting all in one fell swoop! Having already done one jungle show, I am hoping to have some new card samples to show as well as some new demo ideas to showcase. The jungle stamps are some of my favourites to play with, but they aren't exactly technique-orientated type stamps. Hopefully, I can showcase some ideas for cards and layouts that you might not have seen or done before. These stamps do work wonderfully for stairstep cards and trishutter type cards and there are samples of those on my blog from past posts in November if you want to have a look. There are also a number of other jungle themed cards as well mixed in the November posts. If any other followers have made cards using any of the Particraft stamp designs, please, please email them along to me as I would love to see everyone's creative designs!